Released in March 2017, PlayerUnknown’s Battlegrounds pits up to 100 players against each other in a battle royale fight to the death. 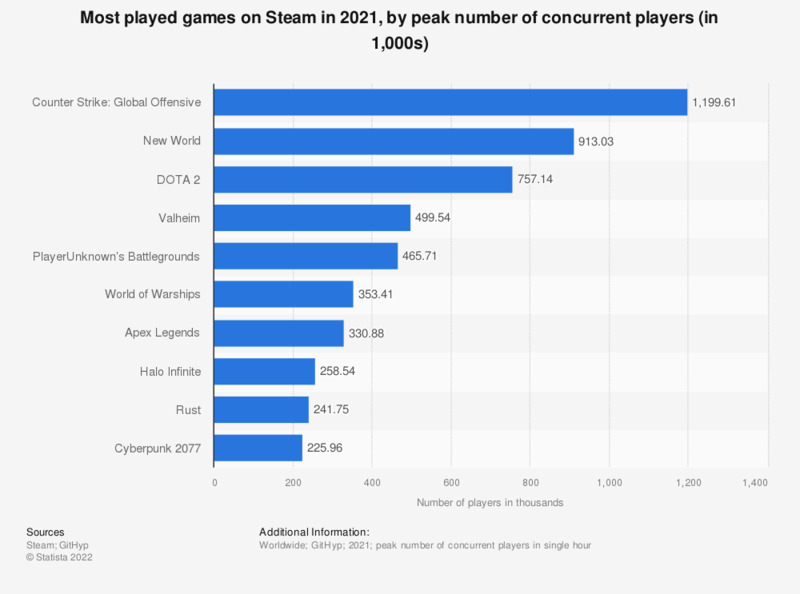 Considering the size of each battle, it is unsurprising that the game topped the 2018 list for peak number of concurrent players on the online gaming platform, Steam. PlayerUnknown’s Battlegrounds reached more than 3.2 million players in a single hour in its peak, far surpassing its closest rival, DOTA 2. Is Steam keeping pace with the console giants? The fight for supremacy between PC and console gamers is an eternal one. However, it seems that Steam, the main online PC gaming platform, is still able to keep up with the console giants. In October 2018, Steam registered a record 18.5 million simultaneous users at peak time, impressive considering the figure stood at 11 million just two years previous. One of the main advantages of Steam is the staggering library of games available to users, and it seems that players are not afraid of splashing the cash to play their favorite games. While PlayerUnknown’s Battlegrounds reigns supreme in the Steam universe, it has stiff competition in the form of its battle royale brother, Fortnite. First released in July 2017, and not available on Steam, free-to-play Fortnite very quickly amassed millions of players and soon became a worldwide hit. Having scooped the award for Best Multiplayer Game at The Game Awards 2018, it seems that Epic Games’ smash hit shows no signs of slowing down. But with new players, such as Apex Legends, constantly entering the game, will Fortnite and PlayerUnknown’s Battlegrounds be able to hold on to their loyal fan bases?